In Six Sigma, you make progress the old-fashioned way — one project at a time. In essence, projects are the unit of change; they define the collective effort by which most Six Sigma progress is accomplished. Projects represent — and in fact are — the level of granularity expressed to manage Six Sigma change, from a single process improvement to a large-scale business improvement effort. Begin your project by stating performance problems in quantifiable terms that define expectations related to desired levels of performance and timing. 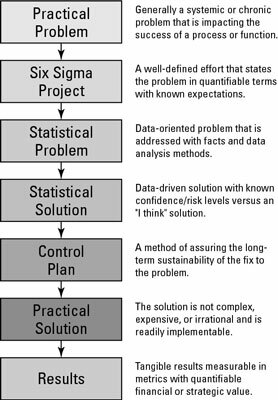 After you’ve framed a particular problem to become a potential Six Sigma project, the problem goes through a critical metamorphosis — it transforms from a practical business problem into a statistical problem. This way, you can identify a statistical solution, which you’ll later transform back into a practical solution. In defining the project, you therefore state your problem in statistical language to ensure that you use data, and only data, to solve it. Using only data forces you to abandon gut feelings, intuition, and best guesses as ways to address your problems. You can’t solve real problems just by throwing time and money at them. You need practical solutions. Six Sigma projects provide practical solutions that aren’t complex, aren’t too difficult to implement, and don’t require extensive resources to affect the improvement. To obtain the maximum benefit from your Six Sigma projects, you must be aware of the strategic needs, goals, and objectives of the business. You should keep those key goals and objectives in mind when you decide which problems you need to solve as part of your Six Sigma projects. You begin by finding areas of the business that need improvement to meet business goals (Recognize). This approach leads you to determine the specific problems you need to solve to improve performance. Then you determine a statistical solution to your problem, implement the solution, and obtain the subsequent benefits. Where to begin? Start by assessing the higher level needs of your organization, using any knowledge obtained from the voice of the customer (VOC) and the voice of the business (VOB). The VOC is all the needs and expectations your customers have for your products and services. The VOB represents all the needs and expectations of the business. The basic idea is to assess both the VOC and VOB to identify gaps — areas where the expectations of the business and expectations of the customer are misaligned. In addition to transforming the problem from the practical domain to the statistical domain, Six Sigma projects also transform the ownership structure. Problems that begin in functional areas transform from line managers through Belts and finally on to process owner. 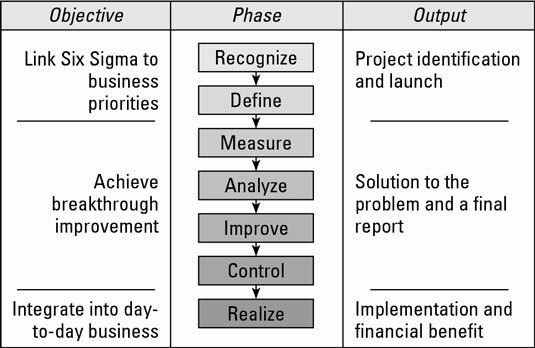 Project responsibilities, accountabilities, and deliverables are divided between managers and the various Belts who perform problem-solving activities. Managers, including the process owner, are responsible for determining priorities and focus, while non-management personnel are responsible for implementing the solution and realizing the benefits. These project lifecycle relationships prevent Six Sigma deliverables from falling into the cracks. Six Sigma is a team effort. 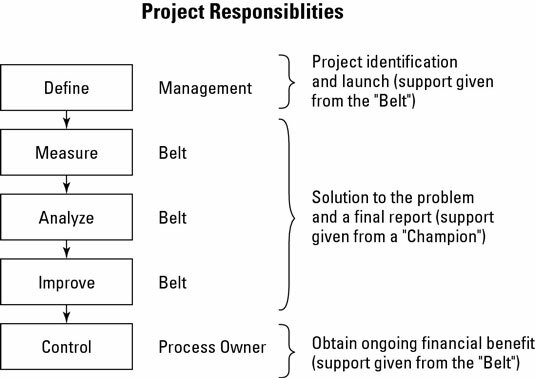 Even in the Define phase, where managers are responsible for project identification and launch, the Belts assist. Generally speaking, Belts have only 20 percent of the responsibility for defining and managing improvement, while the managers have 80 percent. Later, during implementation — the MAIC portion of the breakthrough strategy — these percentages are reversed.